Pursue Perfection but Decide and Fly Adaptively! Striving for perfection is a very worthy goal. But being driven by a deep need to achieve personal perfection in every case can cause serious problems. I believe all good pilots value excellence and strive to meet the very highest standards. But in flying, true perfectionism is often not just tolerated but occasionally encouraged; a bad idea. If perfectionism is about high standards, persistence, and conscientiousness, what’s not to like? Hopefully I can explain the dark side without offending any friends. Perfectionism can cause serious psychopathology because perfectionists believe they themselves also have to achieve an impossible standard—no hesitations, deviations, or inconsistencies. They can become hyper-sensitive to imperfection (in themselves and others) and can fall easily into helplessness and self-recrimination. Perfectionists believe their acceptance is a function of never making mistakes. For a true perfectionists there is never “good enough,” and the “perfect” is always (by definition) out of reach. Psychologists catalog perfectionism as a defense mechanism with a rigid set of rituals designed to avoid failure and shame. Operationally, perfectionists are vulnerable to distress and cognitive rigidity; haunted by a chronic sense of failure as well as indecisiveness, procrastination and shame. Perfectionist pilots can be truly painful to work with since they often display a sense of superiority and condescension as well as an unwillingness to adapt to changing situations. If you see yourself in this description, that is not unusual, since pilots are statistically well represented in this group, (and we probably all have “tendencies.”) I would personally argue however that though we should maintain and aspire to the highest standards and ideal outcomes, we should also fight against rigid perfectionism as a source of weakness. Our game is just too fraught with variables and surprises to be amenable to the rigidity of perfectionism. Our best strategy for decision-making in a rapidly changing, high stakes environment is “satisficing” and heuristics. My common metaphor for decision making in flying is a football game. We of course practice hard, drilling skills and technique. We even run all the hypothetical scenarios and decide the perfect desired course of action with detailed execution in the huddle. But as soon as the ball is snapped and the situation evolves, and everything can change rapidly. In this fluid word of multiple variables and limited time, fast action, improvisation and ingenuity are the more successful strategies. We must employ “fast and frugal decision-making” rather than being frozen and directed to a perfect pre-decided outcome. This decision making concept was developed by a genius (and Nobel prize winning) computer scientist named Herbert Simon way back in the 1950s. He was the first behavioral psychologist and debunked the Renaissance idea of “perfection in knowledge and action.” We live in a fast-changing world where we have limited time, resources, or information and can never make “perfect” choices. He advocated the best choice limited by circumstances which he called “satisficing.” This is also the core concept which pilots call “aeronautical decision making” (ADM). We cannot freeze the action, we must decide on the fly and achieve the best outcome given the limiting factors of time information and resources. The aeronautical origin of this concept was Colonel John Boyd, the famous developer of energy management fighter tactics (and later the F-16 aircraft at the Pentagon). Boyd ran the Nellis AFB “Top Gun” fighter school for years and created the Observe-Orient-Decide-Act model for decision-making in fluid, rapidly changing (usually wartime) conflicts. This was gratefully accepted by the Marine Corps and is taught at every business school in America for business decisions. The book Team Of Teams by Gen. Stanley McChrystal incorporates many of these ideas employing fast-cycle iterations. When the action is fast and furious, the decision making is fast and frugal. The heart of fast and frugal decision-making is the application of “heuristics” or rules of thumb. These predetermined scripts simplify the decision-making process through mental shortcuts. Heuristics bypass the careful, rational (but time consuming) deliberation process and occur decisively and immediately in areas with a clear need for action. These also encompass the habits we, as pilots, work so hard to embed almost instinctively in our operating system. Another term from the military that often describes this ability is TLAR and an anathema to perfectionists. This translates to “that looks about right.” When Apollo 13 blew up (the famous “Houston, we’ve had a problem”) and the play book had to be thrown out, calculations on the “back of the napkin” brought this crippled craft back home with the most accurate splashdown in history. So trust the force a little and work with “satisficing” to achieve the best outcome given the circumstances. You might be better off than frozen looking for the perfect choice. I will be talking about this at Sun ‘N Fun Friday 11AM, in Room 9 at the forums. 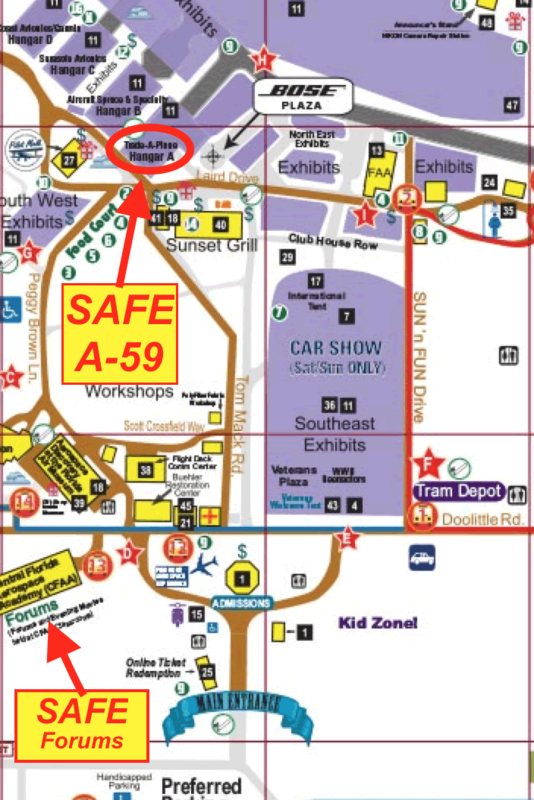 SAFE will be at booth A-59..see you there. Our other SAFE presentations are listed here. Author David St. GeorgePosted on March 25, 2016 September 16, 2017 Categories Uncategorized2 Comments on Pursue Perfection but Decide and Fly Adaptively! Three SAFE Charter Members Earn Master CFI for Tenth Time! David Faile is an AOPA Airport Support Network (ASN) representative, a FAASTeam representative in the Windsor Locks FSDO area, and the holder of the FAA’s Wright Brothers Master Pilot Award. The 1999 National CFI of the Year, David instructs at Bridgeport’s Sikorsky Airport (BDR). Lonnie Hilkemeier is the senior flight instructor and president of Specialty Flight Training (http://www.SpecialtyFlight.com/), a Cessna Pilot Center at Boulder Airport (BDU). Colorado’s first Master Instructor in 1998, he also serves as a FAASTeam representative in the FAA’s Denver FSDO area. Lou Wipotnik is an independent Chicago-area flight and ground instructor at Chicago Executive Airport (PWK). The holder of an FAA Wright Brothers Master Pilot award and the 1996 National CFI of the Year, he is also a FAASTeam representative in the FAA’s DuPage FSDO area and serves in the Civil Air Patrol’s Illinois Wing. According to MICEP co-creator JoAnn Hill, “We are honored that these individuals have continued with the program for so long, and are excited to share their amazing accomplishment.” Others will soon join the ranks of Ten-Time Masters over the upcoming months. The Master Instructor Continuing Education Program was conceived and developed in 1995 by JoAnn and Sandy Hill of Longmont, Colorado, and launched in 1997 during AirVenture with the blessing of then-FAA Administrator Barry Valentine. The Hills, highly experienced educators with a passion for aviation, developed the program as a means to encourage and recognize higher levels of professionalism in aviation education. The program also sets professional standards to which all aviation educators can aspire. The Hills are quick to point out that Master Instructors have “earned their black belts” in aviation education, thus setting them apart from instructors who merely use the job to further their air carrier careers. The evidence bears out the Hills’ assertion: since 1997, a combined 37 individuals have been honored in the National CFI and FAASTeam Rep of the Year categories, 27 of whom are Master Instructors. The marketplace has also responded to their commitment to the profession: a poll revealed that most Masters realize a 10 to 40 percent increase in income as a result of their participation in MICEP. MICEP’s success has been the model for other aviation accreditation programs. The Soaring Society of America (SSA), for example, drew on the Hills work to develop its Master Instructor Cross-Country program. The derivative programs, however, require membership in the sponsoring organizations to participate. MICEP, on the other hand, is open to all qualified aviation educators regardless of their other affiliations; membership in a particular organization is not a prerequisite. With more than 160 active Masters, MICEP remains the largest accreditation program of its type for aviation educators. JoAnn Hill says the program will “continue to serve current Masters while improving outreach to other aviation educators.” Continuing to influence training standards and doctrine, promote industry programs such as General Aviation Awards, and form new partnerships with training providers are goals as well. Author David St. GeorgePosted on March 14, 2016 March 14, 2016 Categories UncategorizedLeave a comment on Three SAFE Charter Members Earn Master CFI for Tenth Time! Adaptability is an important defining trait of human existence and probably most responsible for our survival and growth as a species. Humans live happily in every corner of our planet from polar wastelands to equatorial rain forests and in every case seem to adapt and flourish. I am sure you have seen pictures, or experienced first hand, some amazing conditions people become comfortable with and contentedly call “home.” At first it might be awkward and weird but pretty soon it becomes “normal” as we adapt! Adaptability is also an important trait for pilots. We must overcome diverse challenges transitioning to new equipment or flying in challenging environments. These new conditions at first require courage and ingenuity, but ultimately we conform and become comfortable. Air Inuit in northern Canada has an Op. Spec. to fly passengers “VFR” in Twin Otters with only 300′ ceiling and one mile viz (though this requires <90K, flaps 10 degrees and synthetic vision system for safety). There is, however, a dark side to adaptability and that is the “normalization of deviance.” This term was coined by Diane Vaughan, a professor at Columbia University investigating NASA’s Challenger launch decision in 1986. The process of “normalization of deviance” is when a person or organization becomes so familiar with an odd or deviant behavior that it no longer seems strange and alarming but becomes accepted as the “new normal.” This chameleon psychic process seems to be an integral part of our human survival mechanism. Given time we seem to adapt and accept just about any deviant structure and made it a comfortable part of our world. This is also why a objective “standard operating procedure” (and the discipline to follow it) is such an essential tool in aviation safety. Please check out safety writer Dr. Bill Rhodes definition of “scary pilots” in an article by John King. Tony Kern also documents this phenomenon in the military with his book Rogue Pilot. And popular blogger Tom Rapp explains a scary 135 charter example in detail with his examination of normalization in the Bedford Gulfstream accident. This dangerous “normalization of deviance” occurs even more easily in private aviation where the only normative filter is a (often perfunctory) 2 year flight review. Please don’t stand by if you are aware of cases of compliance drift and normalization. Embrace your normalizing friend and talk some sense into them, carefully and honestly. Let’s embrace the same culture change that cured a lot of unsafe drunk driving; “Friends don’t let friends fly unsafe!” It would be much better to have this friend mad at you than injured. Let’s modify our culture and help everyone embrace a higher standard of safety in their flying. And please Join SAFE in our mission of pursuing aviation excellence. The amazing member benefits alone make this commitment painless and fun. See you at the airport. Stress hormones are catabolic in nature; in other words, they break the body down. In the last issue of SAFE, the magazine, we discussed the problems of stress relating to pilot performance. Now, we’ll continue the conversation. In 1976, Selye described stress as “wear and tear” on the body. Some degree of stress is actually necessary in order to perform day-to-day tasks, but stress which persists over a long period can severely affect human performance and health. Interestingly, individuals with the strongest psychosocial support systems seem to be able to tolerate the most stress without adverse effects (Mitchell, 1997), so creating and maintaining healthy relationships is critical to good stress management. Stress that persists over a long period of time is called cumulative stress. Some clear indications of cumulative stress are physical and emotional exhaustion, apathy, and deterioration in performance. Cumulative stress needs to be dissipated or discharged through physical exercise, meditation, body massage, or other forms of relaxation. Extensive research conducted by NASA over the years confirms that a moderate level of stress has a positive effect on human performance while abnormal levels of stress decrease human performance. Additionally, research findings indicate that the performance of complex or unfamiliar tasks requires a higher level of attention than completion of simple or over-learned tasks, thereby increasing stress levels. During an inflight emergency, the pilot’s workload can quickly exceed his or her capabilities to perform certain tasks within a finite period of time. This inability to respond in itself creates stress, which in the extreme becomes traumatic stress. Everly (1997) makes the point that traumatic stress overwhelms our normal coping mechanisms while cumulative stress erodes them. The analogy that comes to mind is that of an ocean wave. A single ocean wave can easily knock a person down just as a single traumatic episode can overwhelm a person. But it takes many ocean waves over a period of time to erode a beach, just as it takes on going stress to cause “wear and tear” on the body. In theory, as one matures and adapts to life’s many stressors, one learns to cope more effectively with stress. It would seem that as a pilot grows in experience, he or she should be able to handle more stress. However, there is a limit to the amount of stress a human being can handle. This limit varies from individual to individual and also varies over the life span. Elderly individuals generally cannot cope as well with the same amount of stress as a younger person. There are numerous techniques available to cope with the effects of stress, but some of the most helpful techniques are very simple — just make sure you get plenty of exercise, rest, and healthy food. Research studies show that individuals who get less than seven-to-eight hours of sleep per night are not as alert as those who do (Foster & Wulff, 205; Hublin et al., 2007). Additionally, the Operators Guide to Human Factors in Aviation, a compendium of information first published in 2009, cites research to indicate the adverse effects of too much caffeine on pilot judgment and the effects of sitting for too long at a time on pilot performance. Few pilots would think that drinking too much coffee or sitting too long in the cockpit could produce stress, but it does. Stress can be significantly reduced through increased awareness of one’s personal signs of stress. In addition, stress can be successfully managed through meditation, the practice of constructive self-talk, socializing with friends, deep breathing exercises, muscle tension release exercises, visualization or guided imagery, therapeutic massage, reiki therapy, listening to soothing music, and by being appropriately assertive in meeting your own needs. Other stress busters include taking a walk for at least 20 minutes a day, journaling aboutyour thoughts and feelings, planning some “alone time” each day, simplifying your life on all levels, and doing at least one thing each day just because it pleases you. Learn to take control of how you spend your time and you will also reduce your stress level in the process. Stress that isn’t dissipated daily will continue to accumulate over time and either “spill out” at some inappropriate time, such as yelling at your spouse, or become internalized in the form of high blood pressure, migraine headaches, stiff neck, low back pain, chest pain, or an actual heart attack. For that reason, it is important that pilots of all certificate levels learn to recognize their own personal signs of stress and have a plan for dissipating or reducing stress as necessary. The best way to cope with stress as a pilot is to do a thorough job of assessing your own fitness for flight. The checklist in Table 1 was devised by the FAA Aeromedical Branch to aid a pilot in determining fitness for flight FAR 61.53 prohibits a person from serving as “a required pilot flight crewmember” if experiencing “a medical deficiency.” In other words, pilots are expected to ground themselves if they have a physical or mental impairment that affects the safety of flight. Flying when you are depressed, angry, physically ill, fatigued, or emotionally stressed out is never a good idea because such conditions can and do impair pilot judgment. While piloting an aircraft will never be a stress free activity, there are things a pilot can do to minimize the amount of stress experienced. Educating oneself about the effects of stress on human performance generally and on your own performance as a pilot, flight instructor, or crew member in particular can go a long way toward increasing safety of flight and your mental and physical wellbeing. This is an excerpt from our SAFE magazine. Members get full access to this magazine (and so much more!) Please Join SAFE in our mission of pursuing aviation excellence. The amazing member benefits alone make this commitment painless and fun. See you at the airport. Author David St. GeorgePosted on March 5, 2016 March 9, 2016 Categories UncategorizedLeave a comment on Savvy CFI: “Baked In” Human Pilot Problems! Author David St. GeorgePosted on March 3, 2016 March 4, 2016 Categories Uncategorized1 Comment on The New AC-61.65 is Available! CFI Power of the Pen!